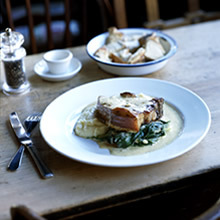 Last Sunday I met some friends at a great little organic gastro pub in North London. The Duke of Cambridge is a dime. Comfortable, affordable and noisy (in the people enjoying their food and their company kind of way), the best bit about this pub is the menu! It's won all sorts of awards. In 2008 alone it won seven awards including The Natural and Organic Awards in association with The Soil Association - Winner of 'Best Restaurant' category, Islington Giant Green Environmental Awards - winner for 'Waste Minimisation' and Good Pub Guide - 'London Dining Pub of the Year'. Nursing a ‘sore' head and an empty stomach I immediately jumped at the roast. I rarely have a hankering for meat but I couldn't help but choose the same meal as our neighbouring table. It was organic pork, red cabbage, duck fried potatoes, carrots with a dollop of fresh applesauce. Filling in every sense of the word - taste buds and tum, it met my expectations and beyond. As my dining friend commented, ‘it looks straight out of the middle ages' and she meant that in the best possible way - wholesome, delicious and practically straight out of the ground! The Duke of Cambridge is the UK's first and only gastro pub to be certified by the Soil Association and 80% of their fresh produce comes from the Home Counties. Everything is organic. Well almost. Everything except the wild fish; this is sourced from sustainable fisheries. Home-baked bread, homemade ice cream and pickles, locally brewed beer and sustainable and locally caught fish are on the menu which ranges in prices from about £7 to £25. From an environmental slant The Duke of Cambridge are, in their words, ‘obsessed with having the lowest carbon footprint possible'. They don't airfreight anything and they re-use and recycle as much as they can. The pub is also run on wind and solar power.